You may not realise it, but you are surrounded by rotor blades. Fans in your computer, the air-conditioning system above your head, the wind turbine creating your renewable energy and the jet engines powering you to your next holiday or business meeting are some examples of technology where rotor blades are essential. Unfortunately, rotor blades create noise and with so many of them, controlling rotor noise is necessary to improve the liveability and health of our communities. Perhaps the most challenging type of rotor noise to control is turbulent trailing edge noise. Trailing edge noise is created by turbulence in the air surrounding the rotor blade passing the blade trailing edge. This noise is produced over a wide range of frequencies (it is broadband in nature) because it is the acoustic signature of turbulence, which is a random mixture of swirling eddies of varying size. Because this noise is driven by turbulence and its interaction with the rotor blade, it is difficult to predict and very challenging to control. Adding porous material to a rotor blade has been shown to provide some noise relief; however, the amount of noise control is usually small and sometimes more noise is created by the porous material itself. The problem to solve is to work out how to fabricate a quiet rotor blade with optimised and integrated porosity. This is a significant departure from current methods, that normally apply standard porous materials late in the design or manufacturing process. We use 3D printing technology to overcome this problem. 3D printing (also known as additive manufacturing) allows complex designs to be realised quickly through carefully controlled deposition of material (polymer, metal or ceramic). We have used 3D printing to explore how porosity in polymers can be optimised with subsurface cavities to provide maximum sound absorption over a wide range of frequencies. Then, we 3D print these porous designs directly into the rotor blade of a fan and test their acoustic performance in a special facility at UNSW Sydney. Figure 1(a) shows 3D printed rotor blades under test at UNSW Sydney, with a picture of the 3D printed blade tip, with porous trailing edge, shown in figure 1(b). A three-bladed fan is shown and in the background, a microphone array. The microphone array allows very accurate noise measurements from the rotor blades. When we compare solid and 3D printed porous blades, significant noise reduction is achieved, as shown in figure 2. Over 10 dB of noise control can be achieved, which is much higher than other control methods. Audio files (see below) allow you to hear the difference between regular solid blades and the 3D printed porous blades. 3D printing has shown that it is possible to produce much quieter rotor blades than we have been able to previously. Our next step is to further optimise the porosity designs to achieve maximum noise reduction. We are also investigating the impact of these designs on aerodynamic performance to ensure excessive drag is not produced. 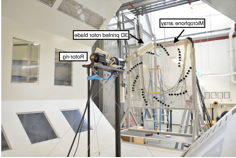 Further, exploring the use of metallic 3D printing systems is required to make more durable rotor blades suitable for extreme environments, such as gas turbine blades. Figure 1. 3D rotor blades under test at UNSW Sydney. (a) Test rig with microphone array; (b) illustration of rotor blade with integrated porosity. Figure 2. 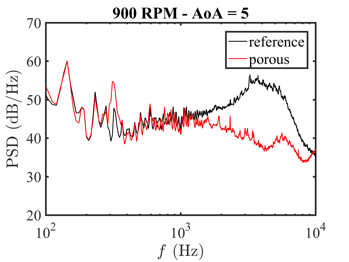 Comparison of noise spectra from solid and porous rotor blades at 900 RPM and blade pitch angle of 5 degrees.